In a large skillet over medium high heat, cook ground beef until browned. Drain grease and return to stovetop. Add taco seasoning and water and simmer for several minutes. Meanwhile preheat oven to 400°F. 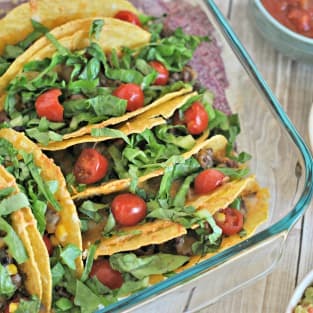 Place taco shells in a 13x9 baking dish. Fill with meat. (add beans and corn if desired) Top with shredded cheese and place in oven for 8-10 minutes. Remove and top with lettuce and tomato. Provide additional toppings if desired. ENJOY!